"Buzzed Driving is Drunk Driving"
Every 51 minutes, someone is killed in an alcohol-related car accident. That’s why we have focused on drunk driving prevention since 1983, when we released the now-classic “Friends Don’t Let Friends Drive Drunk” campaign. Since that campaign’s launch, nearly 70 percent of Americans have tried to stop someone from driving after drinking. The campaign’s current strategy, released in early 2017, prompts viewers to examine their own warning signs of impairment and take responsibility for their decisions behind the wheel. The tagline “Probably Okay isn’t Okay” plants a seed of doubt and reminds drivers to find a safe way home if they’ve been drinking. This longstanding campaign has made a significant impact: between 2005 and 2013, the percentage of young men who said they would always get a ride, taxi, or use public transport rather than drive if they felt buzzed increased from 38 percent to 49 percent. Of course, there is still more to do. 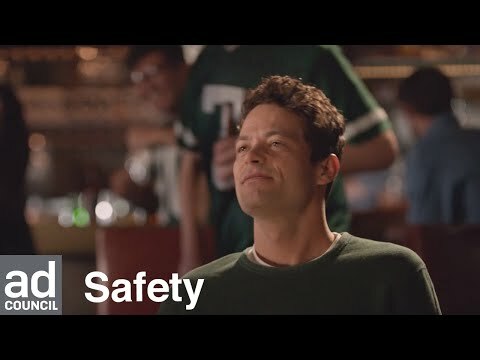 To learn more about our campaign, visit BuzzedDriving.AdCouncil.org, where you can watch the latest PSAs, sign a pledge not to drive buzzed, and share strategies for staying safe.